Awareness campaigns are conducted for the inmates of Abayashram on various aspects. 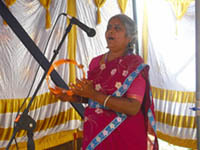 Nearby villagers also participate in such programs. Awareness is created on the falseness and dangers of witchcraft and sorcery. The social workers and volunteers conduct frequent programs to educate the illiterate and families of mentally ill people about the realities of life and career guidance and counselling is given for their future. After these women recover, their field of interest or capability is identified and proper training is given in that field. Basket Weaving, Broom Making, Knitting, Cooking, Housekeeping, Gardening are the usual jobs given to these women. 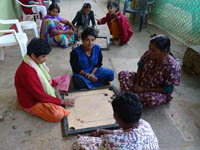 This enables them to be self-reliant when they are reintegrated into society.